Mental skills have been used by Olympic athletes for decades. The term “Psychological Skills Training” is used by sport psychologists. In the Olympic arena, what separates the gold medalist from the athlete in 5th place is not superior physical skill, but superior mental skill. Let’s face it, if you are good enough to place anywhere in the top 5 in Olympic speed-skating, you are already the crème de la crème. It is not raw talent, but the ability to focus fully on the execution of the task just when it matters the most that brings athletes the gold. The same concepts apply to your own high-stakes performances. It is a given that you need to be prepared artistically; that is why you have practiced and studied for years with experienced teachers. Now, how do you bring consistency to your important performances? This is where mental skills come into play. How Do I Get Mental Skills? If only it were as easy as Stuart Smalley makes it look. Combating performance anxiety and achieving your optimal performance is a process. There is a considerable amount of learning, commitment, and practice involved in acquiring the mental skill set necessary to keep yourself grounded every time you step on stage. When you think about how many hours you have spent perfecting your art, it only stands to reason that mastering another skill will take a significant commitment. 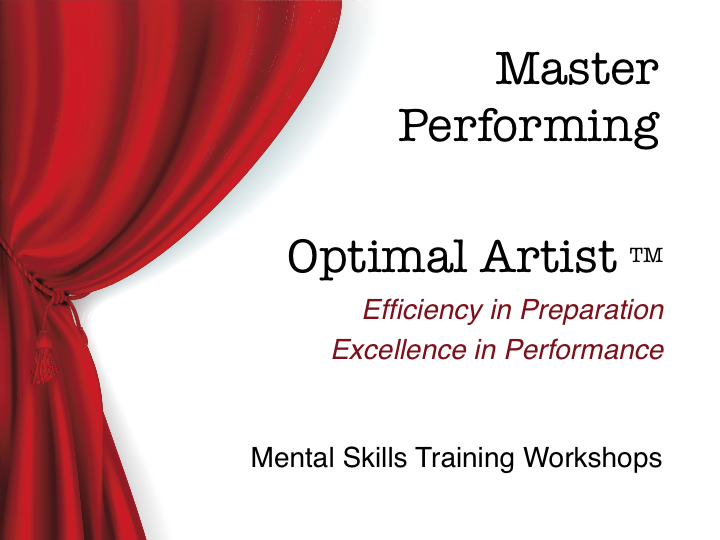 Click here to read more about the Master Performing approach. *Although lucky pet rocks do give you super-powers. We all know that.